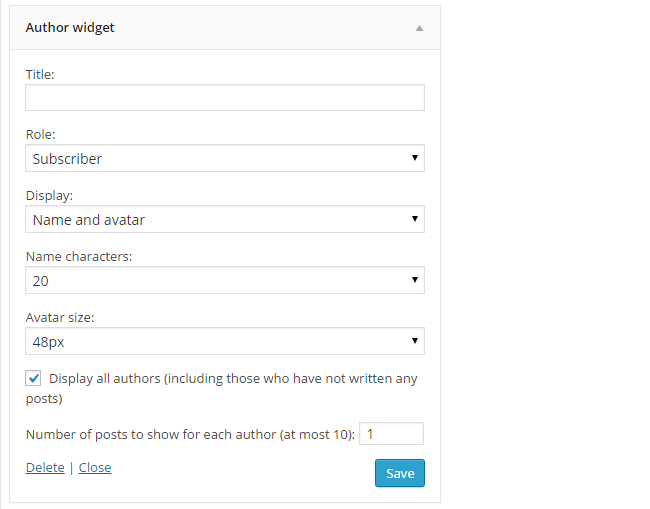 The author widget provides a handy link to authors’ posts on a group blog. Readers just need to click on the authors name to view all post published by that person. Title: Allows you to add your own custom title. For example, Student Authors. Role: Controls which user roles you want displayed in the author list. Displays: Allows you to control what is displayed in the author list. In most situations you would leave it as ‘Name only’. Display options are: Avatar + Name; Avatar only; Name only. If you choose an avatar option users need to upload their own avatar via Users > Your Profile (or Profile > Your Profile). Name Character: Used to control the number of characters displayed. In more situations you would leave it as 20. Avatar size: Controls the size of the avatar displayed next to the blog name, if you choose to the avatar display option. Display all authors: Leave selected if you want all authors listed including those that haven’t published a post. Number: Controls the number of posts that are listed.